Having been placed firmly on our itinerary before we’d even left home, hiring a boat on Kefalonia was one of the things we were most looking forward to on our holiday in Greece. Thankfully, it lived up to expectations and ended up being one of the most memorable days of our trip. Here I detail our Kefalonia boat hire experience and provide some useful tips so that you can do the same. 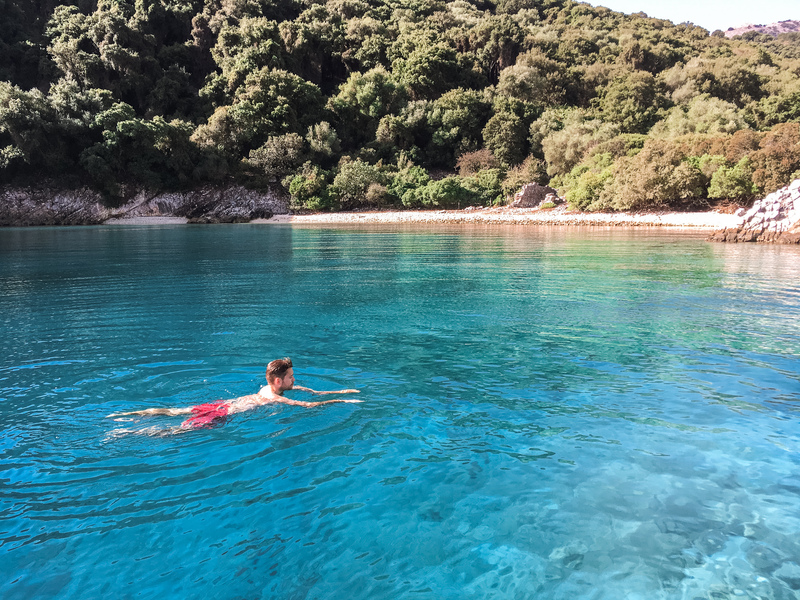 For a guide to Kefalonia and Ithaca and a two-week itinerary, see this blog post. After some research, we’d decided that the beautiful, secluded bays surrounding Agia Efimia made the east coast town the best location to hire a boat from on Kefalonia. Out of the two boat hire companies running in the town, we settled on Boulevard Boats due to their reputable reputation but also, I admit, because their boats were more aesthetically pleasing than the rival Yellow Boats. The guys didn’t disappoint and provided us with a powerful and comfy little speedboat that came equipped with a map of the nearby bays, essential safety equipment, a canopy and an all-important cool box for keeping our lunch and beers nicely chilled. Before setting off, they also gave us a comprehensive lesson on driving and anchoring the boat and made sure we were confident with both of these before setting off. We opted for one of the more expensive boats, which we felt was worth it as it was faster, bigger and more comfortable. This cost us €130 including fuel. There were around ten bays along the coast to explore, many of which are only accessible by boat. Out of all the bays, we found the third from last – named Piglet Bear Bay on Google Maps – to be the prettiest. The secluded little spot is incredibly sheltered, which created an intimate and private feel and made anchoring much easier. With glistening turquoise water, surrounding hills covered in lush greenery and a piercing white pebble beach, it was a magical little spot. We stayed here for a couple of hours with just one other boat for company before setting off to explore. 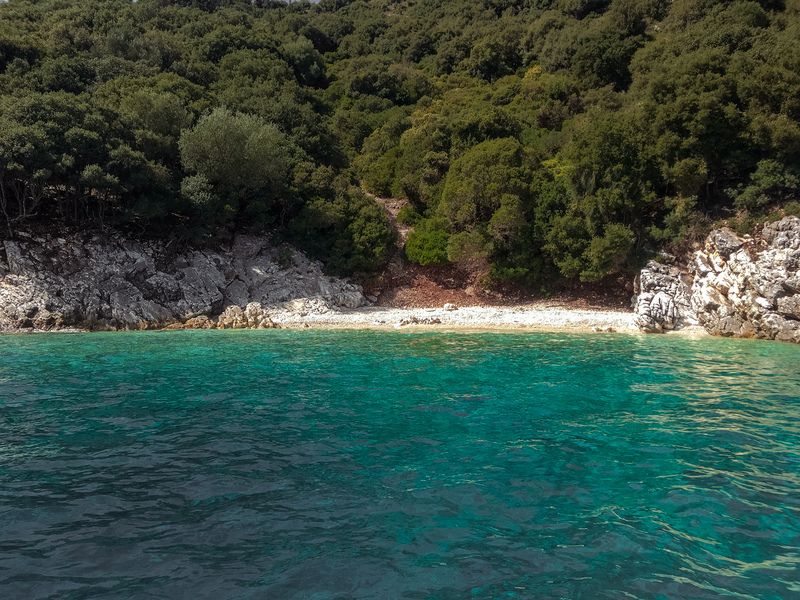 Horgota Beach – the location of the famous jetty scene in Captain Corelli’s Mandolin – Giagana Beach and Roboli Bay also made for picturesque snorkelling spots. Some of the most fun, however, was speeding between each bay – we wanted the freedom to jet out much further! 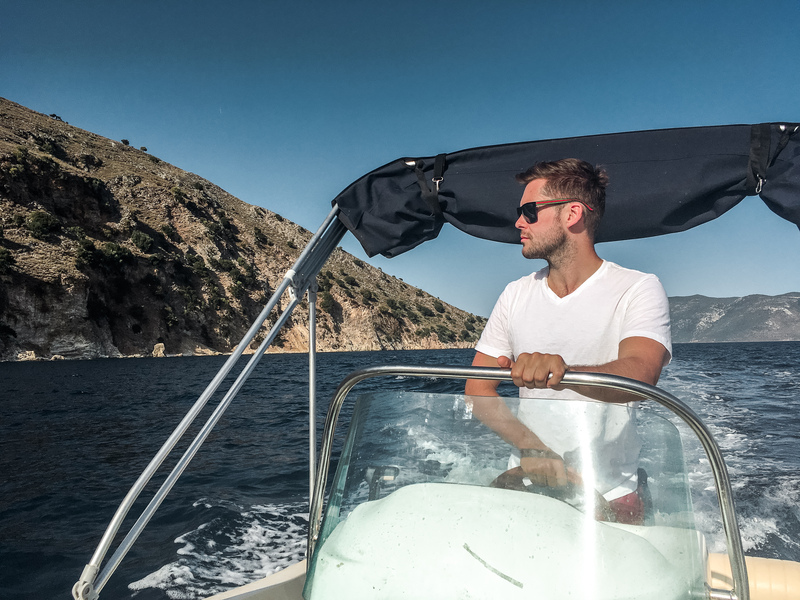 Book your boat at least one day in advance to ensure they’re not all booked up. On the day, be sure to get to the Boulevard Boat Hire office for 8.50am so you’re the first ones out. This also means you get to enjoy the calm morning sea – things get choppy in the afternoon and it becomes difficult to get out to the furthest bays. Head to the furthest bay first and don’t be afraid to give it some throttle to ensure you get some time all by yourself at Piglet Bear Bay. We were the first boat out but as we were concerned about petrol another couple sped past us and reached this bay first. As it turned out, we only used half a tank of fuel for the whole day. Don’t bother anchoring up at the beaches. We found it much easier and more enjoyable to simply anchor in the bays and jump off the boat to swim and snorkel. Plus, the boat’s cushioned seats are far more comfortable than the pebbled beaches. Bring some bread to feed the fish so they surround you while snorkelling. Bring an iced bottled of water to use as ice in the cool box.